Archaeologists have unearthed the skeleton of a late Stone Age man they believe — based on how he was buried — is the first known gay caveman. The excavation in the Czech Republic, said to date back to between 2900 and 2500 BC, revealed a man buried in a way normally reserved only for women of the Corded Ware culture in the Copper Age. Archaeologists do not think it was a mistake or coincidence given the importance attached to funerals during the period, known as the Corded Ware era because of the pottery it produced. “We believe this is one of the earliest cases of what could be described as a ‘transsexual’ or ‘third gender grave’ in the Czech Republic,” archaeologist Katerina Semradova told a press conference on Tuesday. 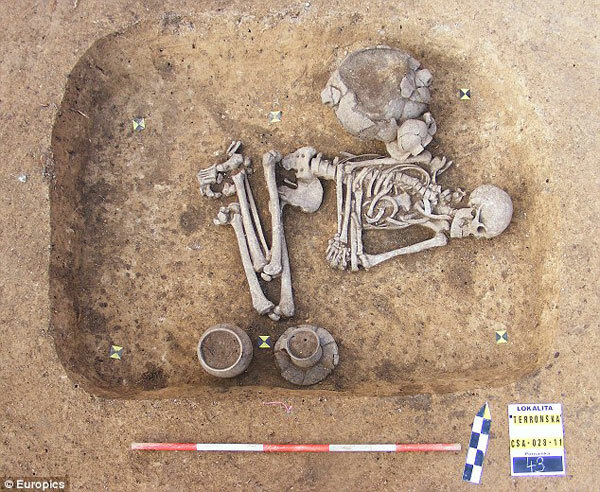 “From history and ethnology, we know that people from this period took funeral rites very seriously so it is highly unlikely that this positioning was a mistake,” said lead researcher Kamila Remisova Vesinova.